I had to try this when I saw how simple the recipe was. You need a skillet or frying pan large enough to fit the fish in it comfortably. I would call that skillet "Dinner Plate Sized". 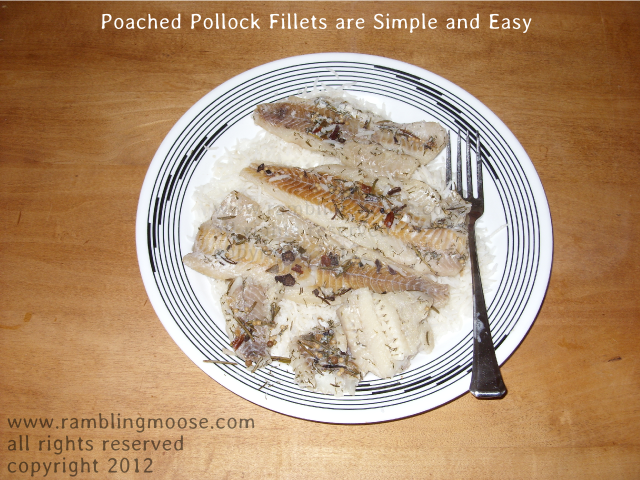 4 Pollock Fillets around 10 ounces of fish. Mind you, if you don't like the idea of wine, you can substitute water and some wine vinegar or balsamic vinegar. The alcohol steamed out and I barely tasted the wine in the fish. The spice mix was a little overdone as well. I'd probably leave out the Rosemary and Pickling Spice or cut them back next time depending on the mood. Frankly the spices are up to you, if you prefer a different mix, go for it. Usually it's a little lemon, a little butter, and a little Dill. This was what I was in the mood for that night. I selected things at random and managed to get the quantities right on first try. Add the water, wine and spice to the skillet. Bring the skillet to a rolling boil. Add fish and bring the skillet back to a rolling boil. The Definition of a Rolling Boil is boiling water or other liquids at the speed so that when you stir them, the bubbles do not go away. I had thought it was a vigorous boil, which is when you boil the daylights out of something. For Frozen Fish, simmer for 8 to 10 minutes or until the fish flakes easily. It will be less time for unfrozen fish, on the order of 6 to 8 minutes. Looking at all of this has me thinking ... I know what lunch will be today!